It's that time again. Soon you will see signs sprouting up all over Palo Alto touting City Council or School Board Candidates and/or election issues. My yard will be colorful! With four council seats and three school board seats available, your vote will be an important voice in determining the future of Palo Alto. No matter which position you espouse - urbanism versus suburbism, fluoride versus no fluoride, incumbents versus newcomers, I urge you to take the time to understand the issues. MRA wants to give you more in-depth opportunities to learn about the issues rather than just reading newspaper headlines or sound bites. We will start with our fourth annual Ice Cream & Issues Social on September 14th in Hoover Park. We have invited the candidates as well as folks who represent both sides of the two referendum issues on the ballot (800 High Street and Fluoridation). This low-key event will allow you to mingle, socialize and have your questions answered and issues explained. As Election Day nears, we are joining with 9 other neighborhoods to co-sponsor a South Palo Alto City Candidates Forum on October 23rd. We are also working with other neighborhoods on a joint questionnaire and will make the responses available on our website. Candidate/Issue kickoffs and coffees are another great chance to talk about issues and discuss the Future of Palo Alto. My hat is off to those elected officials who volunteer many hours a week to make Palo Alto so special. After becoming informed, please don't forget to vote. If you are a newcomer to Palo Alto from outside of Santa Clara County, you will need to register (from within the county, be sure to send in a change of address). Don't forget that absentee ballots are available. They come in handy if you are planning a trip, have a 24 hour a day job, or are just a busy parent with nary a free moment! "When images have come to dominate the political scene, probing for issues takes hard work and care. But the reward for you is a margin of assurance that you'll get the information you need to cast your vote with confidence." The site goes on to describe some excellent pointers: a) seeing through the images, b) taking a good look at campaign information, c) recognizing distortion tactics, d) spotting phony issues, and e) checking out the sources. After all of this, you might want to sprout some lawn signs on your yard too! Midtown Residents: Have you stored enough water for a disaster? The American Red Cross recommends residents store 1 gallon per person per day for 5 to 7 days in case municipal water supplies are disrupted, as they will certainly be in case of a major earthquake. Palo Alto REDI (www.paloaltoredi.org) suspects that not many people have stored near this much water. Some of us (my family included) do have water stored, but we don't change it out very often. So the water may not be very good when we need it. REDI is exploring a method of persuading more people to store more water: promoting the idea of keeping sufficient bottled water on hand to meet the American Red Cross standard and ensuring its freshness by simply drinking and replenishing the supply. Cost? Taking a sample in late August, 2003 using on-line shopping services of the two major grocery chains, you can buy a year's supply in half-liter PET (polyethylene terephthalate) bottles by the case for a family of four for 7 days for between $40 and $80, CRV included, depending on the store and the brand. That's about 9 cases at 24 bottles per case. REDI is looking at half-liter PET bottles because these are ones that many people already carry around during everyday activities. Drinking water is known to be the most healthful alternative, and many of us should probably drink more anyway. What about all that plastic? A year's supply amounts to about 12 pounds of PET plastic per family of four, and that's definitely a concern. We don't take environmental concerns lightly, and we've done some research. The first, most important result is that every single bottle should be recycled ... and CAN be recycled very easily via Palo Alto's convenient program; see www.city.palo-alto.ca.us/recycle for more information. PET (also called "PETE") is one of the best success stories in U.S. recycling history. There is a strong market for post-consumer PET and neither manufacture nor recycling seems to have significant toxic side effects. In addition, some people have concerns about chemicals leaching from plastic bottles. Thus far, we haven't found any convincing evidence of any hazard for water in PET bottles. No chemical process is completely non-polluting, no packaging is perfectly safe, and no recycling program is 100% effect. Ultimately the decision to store emergency water in PET bottles is a matter of weighing what appear to be rather small environmental costs against lives that would be saved in a major disaster. Will this idea work for you? Would you be more likely to store sufficient water for you and your family, and maintain the freshness of this supply by taking care to use and replenish the water? Would you make a strong effort to recycle these bottles? We're good at green, and you can help us get even better. Your city-owned utilities has an admirable record protecting the environment from greenhouse gases. In fact, no California utility of our size or larger has a better record. And now we are offering a new program that allows each of you to help improve our record even further. Last year, less than 30% of Palo Alto's electricity came from fossil-fueled sources generating greenhouse gases. And Palo Alto is working hard on energy conservation to reduce overall demand, both for the City itself as well as for all our customers. During the energy crisis, the City spent $5 million to help residential, commercial and industrial customers install permanent energy saving features. We have already been more than paid back by these energy savings. Our residential program passing out compact fluorescent bulbs was very popular. And we have new programs offering incentives to residents to purchase energy-saving appliances. We have helped residential and commercial customers install solar projects, notably at Ace Hardware, the Foundation for Global Community and several private residences. Within the City, we have replaced all traffic signals with low-energy fluorescent bulbs, saving 1.4 million kilowatts per year, reducing peak energy demand and significantly reducing maintenance costs. And the City's new green building policy provides for Life Cycle Costing analysis on major component replacement projects. Looking to the future, the City has committed to increase our use of new renewable energy - in addition to our current hydroelectric sources, themselves renewable -- to 20% by 2015. We can all help! The City has just launched the PaloAltoGreen program. Each of us can voluntarily sign up to support green energy at an additional cost of just 1� cents per kilowatt hour. For the typical residential user, this would be an increase of less than $10 per month. Be a part of protecting our environment. Visit the City utility website, www.CPAU.com, for details. Or call 329-2161 to sign up today. Bern Beecham is Vice Mayor of Palo Alto and is the Council's liaison for utility matters. He is also Chairman of the Northern California Power Agency and is Vice-Chairman of the Bay Area Water Conservation Agency. Building 800 High Street will replace the abandoned Peninsula Creamery site with 61 housing units, that will include 10 affordable units, neighborhood retail space and 201 underground parking spaces, including 63 free public parking spaces for use by local businesses and residents. On February 18, 2003, the City Council reconfirmed their approval of February 3, 2003, to adopt a planned community zoning to allow a 61-unit housing project to be built at 800 High Street. The project is in complete compliance with the City's Comprehensive Plan and zoning ordinance. The density meets Comprehensive Plan goals for higher density housing near transit-oriented locations, and includes 10 below-market-rate housing units with a mix of one, two and three bedroom units. The Architectural Review Board (ARB) and Planning and Transportation Commission (P&TC) recommendations for design and land use were considered at length in eight public hearings. The Historic Resources Board considered the plan's compatibility with historic goals in the SOFA 2 area at five additional public hearings. After each review, changes were made to the project to reflect requests of the various boards, commissions and Council. We believe that the final project is a much better design as a result. 800 High Street Projects Facts and Benefits: Located within three blocks of the University Avenue CalTrain station, supporting mass transit in the area. Provides 10 new affordable housing units allowing homeownership opportunities for teachers, firefighters, police officers and other residents. Provides ample parking for all uses, including retail and residential guests, as well as an additional 63 spaces for public use at a value to the City of Palo Alto of more than $2,000,000. The City will receive more than $600,000 in development fees from this project to help fund our local schools, parks and playing fields. Provides underground parking access to adjacent City-owned property that will enable future affordable housing opportunities. Neighborhood commercial space will be provided along the Homer Avenue frontage, consistent with the community's desire for retail compatible with Whole Foods, Peet's Coffee and other retail uses in the area. Publicly accessible plazas will be incorporated in the project at both the Channing/High and Homer/High intersections to enhance neighborhood use of the site. 800 High will raise the size and density demands for other proposed developments: Hyatt Rickey's, Elks, Alma and Edgewood Plazas. It encourages speculation by inflating property values and rents - driving out local businesses, and eliminating truly affordable housing opportunities. We agree Palo Alto needs housing for its teachers and public workforce. Yet the vast majority (51) of 800 High's units are expensive market-rate condominiums. The remaining 10 Below Market Rate (BMR) units are priced for household incomes far above the income of most teachers whose starting salary is $44,000. To qualify for purchase, one person must earn at least $59,000 for the smallest BMR unit; a household must earn at least $105,000 for the largest BMR unit. In exchange for giving windfall profits to the developer, Palo Alto gets heavier traffic, higher rents, an exodus of small retailers, loss of an historic landmark and an increased need for costly public services. Plus we get only the minimum number of required BMR units, few of which are actually affordable to our public workforce. Mike Wallau and Gary Burke are neighbors, but although they both grew up in Midtown they don't live on the same street. They share a prominent building together as the owner of Mike's Caf� Etc. and Peninsula Hardware, respectively. Although they didn't know each other growing up in the 50s and 60s, both remember the area as full of orchards with Eddy's Caf� and Toy World, the Quonset hut that was Purity Supreme, and California Paint and Wallpaper on Middlefield. Each in his own way has kept the one on one with customers we remember from back then. They share a commitment to knowing and valuing their customers and treating them like neighbors. Mike took over Joanie's Country Fare more than eight years ago and worked for 20 hours a day to get Mike's Caf� Etc (Etc stands for wife Ellen, and daughters, Taylor and Chelsea) up and running in less than two weeks. The time was another of Silicon Valley's famous downturns and Midtown was a bleak area. He bought the restaurant with a pledge of monthly payments to its owner because he knew Midtown and believed in it. He needed to be profitable as soon as possible, and after the first week he was. 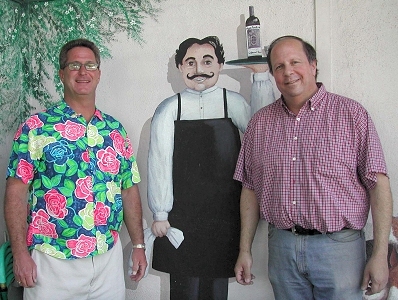 He knew the business and knew what it took to be a success, having worked at just about every restaurant job from busboy at L'Auberge to head waiter in his career, the last spot being Il Fornaio. His formula of a quality product, good service and a fair value has been bringing Midtown residents and non-residents in ever since. Now, Mike's Caf� will have a sister restaurant when Mike opens his second eatery further down Middlefield in Menlo Park, at Willow, at the end of October. It will be open, beginning with breakfast, seven days a week. And Mike and his dad will continue to personally greet customers. To a hot pan, add four tablespoons of olive oil and one tablespoon of fresh garlic. Cook. Add swordfish, medallions, tiger prawns, green lipped mussles and manila clams. Cook till tender. Reduce with chardonnay wine. Season with fresh basil, salt, and pepper to taste. Serve over al-dente fresh linguini pasta. HOOVER PARK NOON TILL 3:30 PM. Talk with candidates for the school board and council as well as the Midtown Steering Committee. Fill out and return the enclosed survey so we can get your feedback. Hear both sides of the 2 election measures - 800 High and Fluoridation in water of Palo Alto. Tomato Tasting, Face Painting, Folk Singing. of the Winning Poems. Tentatively first weekend of October.